This book is about forming and living in small life giving religious communities. It will be of help to anyone acting as a facilitator or consultant to those involved in the development of such communities. But it has been written expressly to help members of communities who have to think things through for themselves when they do not have access to a facilitator or consultant - and for most religious that is most of the time. It is, in fact, a practical self-help manual to be used in relation to tasks rather than a text book to be read. The book deals with such matters as decision making, problem solving and community meetings, moving from one community to another, re-forming, healing, repairing, and reviewing life and ministry, and the difficult task of closure. It breaks down tasks and processes into manageable steps and notes the things to attend to at each stage. Consequently, the book is about what is involved in religious applying the theology of Vatican II in their community life and apostolic work. Small communities shaped in this way effuse the particular spirituality and charism of their order and the concepts of collegiality, subsidiarity and collaborative reflective ministry in quite startling ways. This is written primarily out of experience with Roman Catholic religious, mainly women. However, the principles, processes and much of the material are, suitably adapted, widely applicable to work with all kinds of communities of men and/or women, secular, religious, and ecumenical. "It would be well for every community library to have a copy; maybe it would sometimes be profitable to have it in our personal place of prayer." 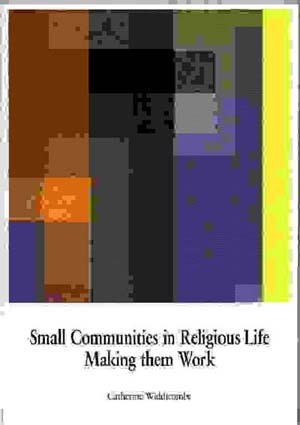 "This is a practical handbook which will be useful to anyone having dealings with small communities, whether those with overall responsibility for forming and supporting them, or members of religious communities at all levels...This is a book which will be of enormous help to all who aspire to community life, religious or secular."